Family-school partnerships are increasingly touted as a means of improving both student and school improvement. This recognition has led to an increase in policies and initiatives that offer the following benefits: improved communication between parents and educators; home and school goals that are mutually supportive and shared; better understanding of the complexities impinging on children's development; and pooling of family and school resources to find and implement solutions to shared goals. This is the first comprehensive review of what is known about the effects of home-school partnerships on student and school achievement. It provides a brief history of home-school partnerships, presents evidence-based practices for working with families across developmental stages, and provides an agenda for future research and policy. Key features include:provides comprehensive, cross-disciplinary coverage of theoretical issues and research concerning family-school partnerships. describes those aspects of school-family partnerships that have been adequately researched and promotes their implementation as evidence-based interventions. 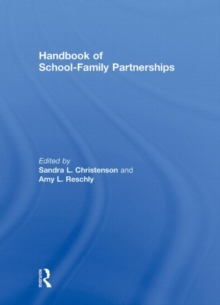 charts cutting-edge research agendas & methods for exploring school-family partnerships. charts the implications such research has for training, policy and practice especially regarding educational disparities. This book is appropriate for researchers, instructors, and graduate students in the following areas: school counseling, school psychology, educational psychology, school leadership, special education, and school social work. It is also appropriate for the academic libraries serving these audiences.